It’s hard to say when exactly the next generation BMW X5 M will debut, but we wouldn’t be surprised to see that happen next September at the Frankfurt Motor Show. We’ve seen spy shots of the powerful new SUV testing on both the track and in the snow but today, thanks to Bimmerpost, we have some newly leaked images of some final production vehicles sans camouflage. It appears they were taken at BMW's Spartanburg, South Carolina production plant, home of the X5 (and X3, X4, X6, and X7). Unfortunately, there’s not a single shot with the entire vehicle in the frame, but instead several close-up details shots. These include the front and rear ends, interior, and badging (just to prove what we’re looking at is the 2020 X5 M). And speaking of badging, one of the X5 Ms we’re looking at here has the Competition Package which will, among other things, offer more power than the "standard” M model. That power is expected to be sourced from the F90 M5’s S63 4.4-liter twin-turbo V8. In base trim, that engine spits out 591 hp and 553 lb-ft of torque. The Competition model increases it to 617 hp while torque remains the same. 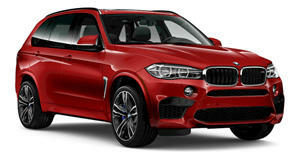 In other words, the new X5 M will very likely deliver over 600 hp. Word has it that BMW will increase output to just over 600 hp for the base model. Imagine what the Competition pack will be like. All of that power will be distributed to all four wheels through an eight-speed automatic. The xDrive all-wheel-drive system will be standard. Looking a bit more closely at the leaked images, you’ll notice quad exhaust pipes, bigger and beefier wheels, and enlarged front air vents. The rear bumper, at least in our eyes, has some 8 Series styling going on. These are all just some of the typical fixins from the M division and we’ll surely find out about more of them through this spring and summer as the official launch date gets closer.